Nearly 57% of HR heads and hiring managers covered in a survey on the impact of the ecommerce sector on FMCG talent have revealed that over the past three years the attrition ratio in their organisations has gone up. 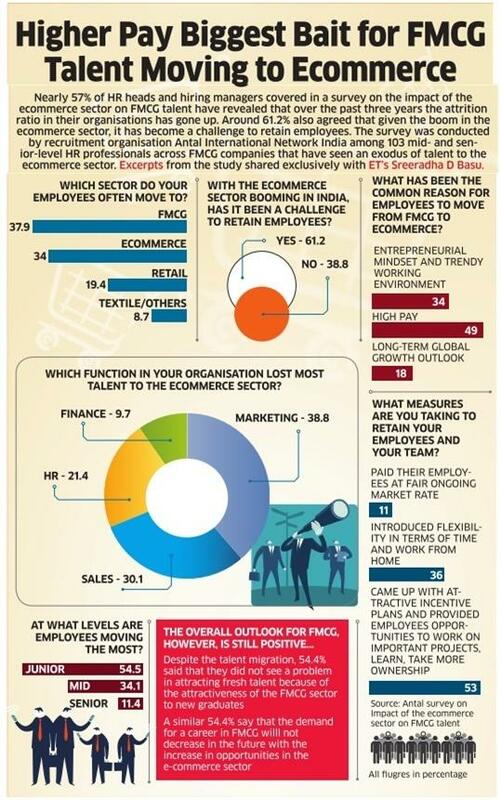 Around 61.2% also agreed that given the boom in the ecommerce sector, it has become a challenge to retain employees. The survey was conducted by recruitment organisation Antal International Network India among 103 mid- and senior-level HR professionals across FMCG companies that have seen an exodus of talent to the ecommerce sector. Excerpts from the study shared exclusively with ET. Festival season is here but this time around the celebratory gleam had sparked off even before this season set it. Ecommerce companies had flexed their muscles well in advance for this season, resulting in hiring of about 35 per cent additional temporary staff to cater to the festival consumer demand. This, of course, comes with an anticipation that hiring and market sentiment will remain upbeat even after the festival season. This year started on a high note with startups taking the crown in jobs, entrepreneurship segment but with startups hitting a rough patch, both these segments have seen a stagnant sentiment too. Will this festive hiring kick start a fresh lease of activity in the employment sector? Will this year end on a high note or a rough patch? We asked market insiders and their outlook seemed positive. 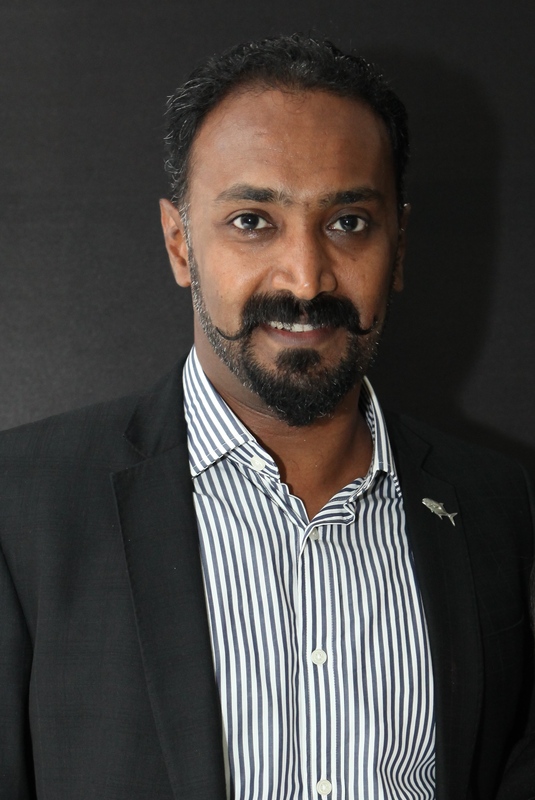 Joseph Devasia, Managing Director, Antal International Network, India feels optimistic about the entire scenario. “No this is not just for ‘festive hiring’ although the big sale days do need excess resources and the big ecommerce companies have already equipped themselves for the onslaught,” says Joseph Devasia. Pranshu Upadhyay, Director, Michael Page India also had the same outlook. “Hiring at management level is typically set for long-term and strategic than just festive hiring. Ramping up of headcount ahead of big sale days where retailers pick up around 50% of their year’s sales is more common at the level of temporary hires. There are a lot of recruitment drives that are happening in metros as well to rope in delivery boys ahead of the festive sale. Companies want to be more prepared from an operational standpoint to handle large volumes,” he said. Is festive hiring an ecommerce phenomenon or general? “This is more for the bigger ecommerce companies, it is not wholly reflective of India Inc although there is positive movements generally across other sectors,” says Joseph Devasia. Pranshu Upadhyay feels that though hiring activity has picked up in ecommerce allied sectors as well, some of the other sectors that see an upward trend in hiring are retail, consumer durables, FMCG and logistics. “There seems to be positive sentiments although a lot does hinge on the how the K-crisis pans out as well,” advises Joseph Devasia. Pranshu Upadhyay feels that the general employment outlook is positive for this year. “Organisations continue to focus on replacement hires however the companies closing their financial year in December are waiting for the end of Q4 to have clearer projection on new headcount. This will be aligned to the organisation’s 2017 targets,” he says. Attracting the best talent is a challenge given the growing competition in a candidate-driven market, as many as 85.5 per cent startups said in a survey by global executive recruitment organisation Antal International. Not surprisingly then, as high as 83 per cent of them said they are willing to pay higher fees to specialist recruiters to help them find outstanding individuals who can best fit in the company. 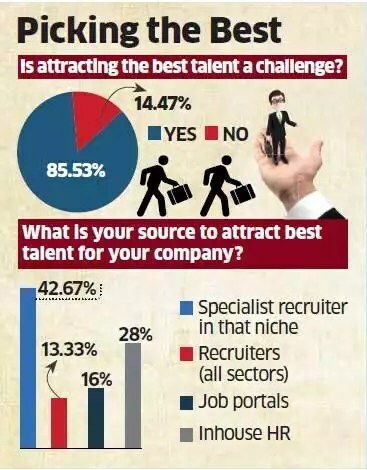 A majority of the 76 respondents in the ‘Recruitment Trends among Startups in India’ survey said that attracting the best talent that can help companies scale up needs a strategic vision from the top. In fact, more than 60 per cent respondents admitted that over the past two years they suffered revenue losses which can be directly attributed to wrong hiring choices. “This underscores the criticality of hiring the best,” said Joseph Devasia, managing director, Antal International. As many as 91 per cent line managers said that employer branding is very important and key to attracting best talent to their company. Employer branding is not just related to what the market knows about the company’s work culture but also how each individual candidate was treated during the interview. Candidate experience was felt to be a major element in employer branding. In order to zero in on the right candidates, more companies were seen to be relying on specialist recruiters. According to the survey, 43 per cent were found to be working with specialist recruiters and only 13 per cent with generalist recruiters. Inhouse HR was the No 2 choice for hiring managers in getting talent onboard. This was followed by 16 per cent respondents looking at job boards. More consolidation is expected in the online recruitment sector, with job portals losing marketshare to social media platforms like LinkedIn, Facebook and Twitter, experts say. The global job industry is rapidly transforming because of wide technological advances. Over the last couple of years, online job portals have lost a significant ground to social media platforms as a talent sourcing channel, according to HR experts. “Lines of business are blurring and if one doesn’t keep pace with same, one has to face redundancy or consolidation,” staffing services company TeamLease Co-founder and Senior VP Rituparna Chakraborty said. Going forward, innovations in the areas of building reach, engaging and keeping track of ‘passive users’ and how one runs background analytics are expected, HR experts say. “They are. Because the problem of sourcing is already solved. Earlier Naukri.com, monster.com used to be the sites where one could find people. Now one can find people on LinkedIn, Facebook, Twitter, CoCubes and the like,” assessment platform CoCubes Technologies Co-Founder and CEO Harpreet Singh Grover said. Devasia further noted these deals are “very strategic moves for those businesses who could not capitalise on their customer base and create a social relevant business”. How long have you been working with Antal International, and what inspired you to set it up in India? My association with Antal goes back almost a decade; it was in 2006 that I brought the Antal brand to India and became Antal’s first franchisee in the country. While considering entrepreneurship I was looking at a business where I could utilise my industry expertise and knowledge, and happened to drop my card at the Antal booth during a franchise exhibition. I got a call from Kevin Cox for a meeting, liked the proposition of getting back into the Indian market with a well-established international brand, and voila! Here we are, moving ahead steadily. Business services are a huge sector in the franchise industry. What makes Antal stand out from the others? Antal is one of the few global recruitment businesses which can confidently boast that our proven and successful business model has helped several aspiring individuals start up their own recruitment businesses. Our deep-rooted values, systems, processes and practices are appreciated by both clients and candidates and are supported by testimonials, and our loyal clients who we have built lasting business relations with are in themselves a placard that has made us stand out in the industry for the last 23 years. Our inch-wide, mile-deep market specialisation gives us access to strategic, confidential sectorial information which allows us to bring our clients crucial information that will help make business-altering decisions. This approach enables us to become trusted advisors to our clients. The global network of offices and knowledge-sharing practices across the world is a unique feature at Antal which no other recruitment firm can boast. Antal’s knowledge-focused recruiter understands the industry/sector dynamics and is trained to speak the same language as the hiring manager; this helps us to meet our client expectations in any industry/sector/discipline/location. Last year Antal India welcomed a high number of new franchise partners. How did it achieve this? Honestly the approach has been multifaceted and has delivered returns. We have various internal marketing and PR strategies that have helped and there is no denying that our brand has a stronger recall value today in the Indian market compared to a couple of years back. This along with alliances with a couple of franchise portals and LinkedIn have been able to generate a substantial amount of leads which get further filtered down by our team based on the question: “Is this the right business for them and are they the right fit for us?” I believe our ability to offer a higher quality recruitment service and deliver professional services to our clients has brought great value to the Indian recruitment market as well as to someone who is exploring entrepreneurship with us. Describe a person who would do well as a franchise operator with Antal India. Any individual with at least a decade of professional background, sales ability, specific industry expertise, ability to invest, and entrepreneurial spirit is eligible to buy the Antal franchise. It is important to highlight that our business is about connecting with people and that is one of the major factors that led to Tony Goodwin (a chartered accountant by profession) founding Antal. What is the number one piece of advice you would give to a first-time franchisee? Take the risk, enjoy the rewards. I’ve told many new owners and prospective franchisees alike to learn from my mistakes; what that means is we have relevant experience in the Indian market to share local best practices regarding clients, candidates and fees which is a good point to start from for all new owners. Having said that, obviously there is a learning curve in any business, but if one has a great professional background and enjoys talking professionally to people then this kind of business can help them make money while letting them be their own boss. Self-employment gives one the opportunity to take up every aspect of a business and strive for success. What is the outlook for the business services industry as a whole for the next year i.e. is it growing? The business services industry generally seems to be on an upswing – positive economic conditions and a rise in business spending has increased the demand for professional business services. There is a surge in the demand for professionals who can consult multinational corporations as well as startups in various functions such as recruitment, finance, secretarial, compliance, etc. At the same time, there is also an increase in the number of aspiring entrepreneurs who want to start something on their own, and franchising options within business services are allowing professionals to utilise the current scenario and their professional expertise to their benefit. Over the coming months business services are surely set to see high growth. What are Antal India’s goals/targets for the next 12 months? Over the last five years, since Antal started franchising in India, we have added 35 new franchisees to our network. We are now in a position of strength with Antal’s brand being well received and respected amongst clients and candidates across the country. With a team that is exceptionally strong in training and PR, I believe Antal can add another 15 franchisees to its Indian network this year. Over the next four years we intend to be able to breach the 100 number and get to a position where we can claim to have a significant share in the recruitment market in India. Has advertising/working with Franchise Asia been satisfactory for you? We have been very happy with the client management done by the team at Franchise Asia catering to India-specific leads for our brand expansion. In India most prospective franchisees usually look at a product franchise or a franchise where they can invest less and get back a good ROI, however with our model it requires far more input and persistence and the rewards come over a longer period of time monetarily. We have received proactive support from the Franchise Asia team to tweak the campaign they run for us which we commend and appreciate. Why Recruiters undersell themselves by charging low fees? Hiring the right talent usually is a complex decision making process which takes significant effort, time and is not an easy task at all. Despite the product, investment, idea that goes into making a successful business, hiring top quality talent is the single biggest differentiator for all companies that make it or don’t. The Indian job market is highly competitive today and with the emergence of new age, technology oriented businesses the war for talent has only intensified. Within this context, when the talent is available it usually is challenging to identify the best from the rest. Clients realize this; therefore, they are willing to shell out premium fees to recruiters to bring them the best talent available in a highly fierce market. We have had numerous examples to quote where our clients were more than happy to work with us on slightly premium fees, because of the value we added in the hiring process. This leads me to ponder: why recruiters sell themselves short in spite of the business willing to pay for good talent. Is there a validation for the work recruiters do? Do recruiters value the time and effort they invest in sourcing and recruiting talent which is rare and needs indepth industry expertise to be recognized and recruited? A recruiter may not be fully versed with of the recruitment methodology they use to acquire talent. As a recruiter, you have to be convinced of the service you are selling. The brand, the process, the values of the brand, the techniques….all of it. Its simple logic only if you are convinced with an ideology, can you sell it to another person. The same applies to a recruiter being convinced with his recruitment methods as well as his skills as a recruiter to identify and attract ‘A’ listed talent. Networking is a very crucial part of a recruiter’s daily routine. This helps him create a strong pipeline of exceptional candidates. Most recruiters do not want to spend time knowing their candidates or building a trust worthy relationship with them. Most recruiters find this exercise to be tedious, time consuming and hence they do not network enough and therefore end up with a weak pipeline of candidates picked up on job portals who may not be the best and that may justify the low fee they charge. Another key reason could be low self-worth or low self-esteem. A recruiter may feel he is not worth or his capability as a recruiter is not good enough to demand a high fee for the work he is doing. Lack of self confidence in ones work or in self is a major reason why recruiters fail to quote fee they and their work deserves. Low self-esteem can prove fatal not only to a recruiter but also his client. Ambitious, successful recruiters are optimistic, committed to excellence and absolutely convinced of their service. The next most critical point is niche specialism. Let me give you an example, if you have a heart ailment, you wouldn’t go to a general physician you would opt to see a cardiac specialist, correct? Now it’s obvious that their consulting fees will differ as well. A cardiologist will charge much higher compared to a general physician simply because he is a specialist. Similarly a niche recruiter will charge more than a general recruiter simply because of his indepth industry knowledge, access to the best talent in the industry, understanding of the skills needed to excel in the industry etc. Over the past 10 years of having made 3000 successful placements I have worked only with clients willing to pay a slightly higher premium. At first they were skeptical however like with most others they too realized that at Antal we bring more depth to the hiring process and compliment the Talent Acquisition team beyond expectation. This does not mean we have been successful all of the times, after all we are human. CHENNAI: The Tamil Nadu government recently clarified that IT and ITES companies also come under the Industrial Disputes Act,1947, and the employees can form trade unions to protect their rights. In a country that boasts of great trade unionists, only a few received the news with applause, while many others do not seem to think much of it. So, are trade unions going to revolutionise the IT industry or is much ado being made about nothing? Parimala, President of the forum, says trade unions will definitely take time to fully take shape and form. “It could take a few years, but it is great that the government has decided to take a stance on the issue. More awareness on trade unions will encourage more employees to join in. For years, it was a myth that IT sectors cannot have an union, and now we finally have a platform to demand our rights and fight against the injustice meted out to us,” she adds. While Parimala agreed that trade unions will take some time to become strong, Priya Sriram, a Director for People’s Operations (HR), questions if employees stay in a company long enough to become permanent members of a union. “The shelf life of a techie in one company is between nine months and two years. I can say this from having more than 15 years of experience in this sector. So who stays? Who handles the union? Is it in the employees’ best interest to shove all responsibility into a few people’s hands? Moreover, since IT is anyway one of the most organised sectors in comparison to others, there’s no chance that a trade union will even kick off,” feels Priya. Ganesh Janakiraman, who recruits for ITES companies, says that there is a certain cycle in the sector, which requires new talent for the growth of the company. “If employees end up demanding life-time security from one company, it would compromise on the firm’s growth,” he points out. While tech bigwigs feel that their employees might not have any interest in joining a trade union, and that it might not cost the company, at least immediately, there is prohibition of trade unions in certain states for specific reasons. Three years ago, Karnataka tried to lift a decade-long exemption of the IT sector from the Industrial Employment Act, but had to retract its stand in a couple of months, due to pressure.